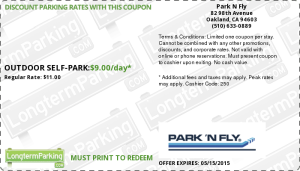 The Park N Fly Coupon for the Oakland Airport in California is now valid this year 2015. 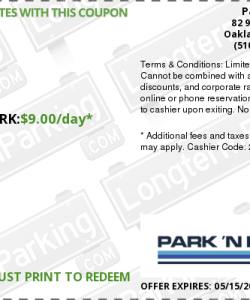 You can get some amazing discount parking rates with this coupon for the outdoor self-park at just $9 Dollars a DAY! It usually costs you $11 bucks a day, that’s a good saving for a week trip or even longer. We all know that when you go to the Oakland airport, you’d prefer not to have to leave your car at the airport parking. It just costs way to much, but with this Park N Fly Coupon, you’re all set. You park nearby, use the coupon and save some extra cash. Win! Win!